In this guide, we'll explain how to install an Apache web server on your Ubuntu 18.04 server. Before you begin this guide, you should have a regular, non-root user with sudo privileges configured on your server. Additionally, you will need to enable a basic firewall to block non-essential ports. You can learn how to configure a regular user account and set up a firewall for your server by following our initial server setup guide for Ubuntu 18.04. Apache is available within Ubuntu's default software repositories, making it possible to install it using conventional package management tools. After confirming the installation, apt will install Apache and all required dependencies. Before testing Apache, it's necessary to modify the firewall settings to allow outside access to the default web ports. Assuming that you followed the instructions in the prerequisites, you should have a UFW firewall configured to restrict access to your server. During installation, Apache registers itself with UFW to provide a few application profiles that can be used to enable or disable access to Apache through the firewall. At the end of the installation process, Ubuntu 18.04 starts Apache. The web server should already be up and running. This page indicates that Apache is working correctly. It also includes some basic information about important Apache files and directory locations. 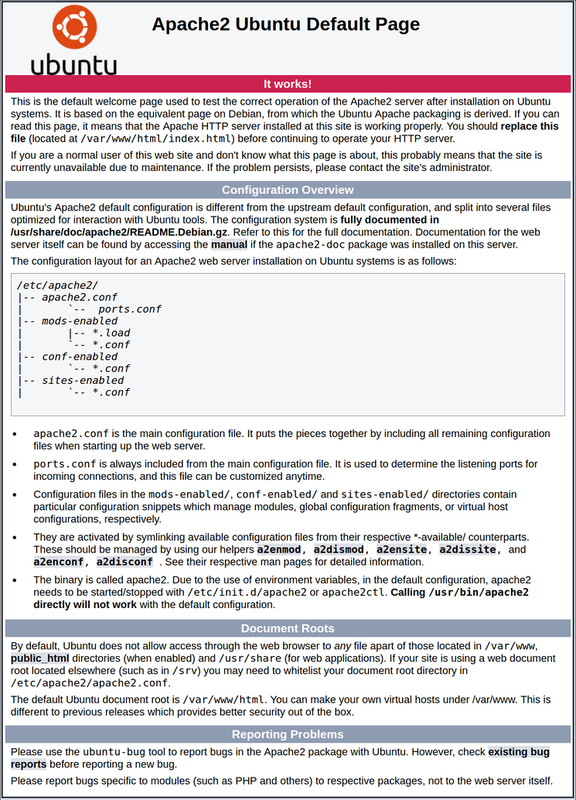 Apache on Ubuntu 18.04 has one server block enabled by default that is configured to serve documents from the /var/www/html directory. While this works well for a single site, it can become unwieldy if you are hosting multiple sites. Instead of modifying /var/www/html, let's create a directory structure within /var/www for our example.com site, leaving /var/www/html in place as the default directory to be served if a client request doesn't match any other sites. Notice that we've updated the DocumentRoot to our new directory and ServerAdmin to an email that the example.com site administrator can access. We've also added two directives: ServerName, which establishes the base domain that should match for this virtual host definition, and ServerAlias, which defines further names that should match as if they were the base name. Now that you know how to manage the Apache service itself, you should take a few minutes to familiarize yourself with a few important directories and files. /etc/apache2/sites-available/: The directory where per-site virtual hosts can be stored. Apache will not use the configuration files found in this directory unless they are linked to the sites-enabled directory. Typically, all server block configuration is done in this directory, and then enabled by linking to the other directory with the a2ensite command. /etc/apache2/sites-enabled/: The directory where enabled per-site virtual hosts are stored. Typically, these are created by linking to configuration files found in the sites-available directory with the a2ensite. Apache reads the configuration files and links found in this directory when it starts or reloads to compile a complete configuration. Now that you have your web server installed, you have many options for the type of content you can serve and the technologies you can use to create a richer experience. If you'd like to build out a more complete application stack, you can look at this article on how to configure a LAMP stack on Ubuntu 18.04.